First I made this Candy Corn White Chocolate Halloween Bark. 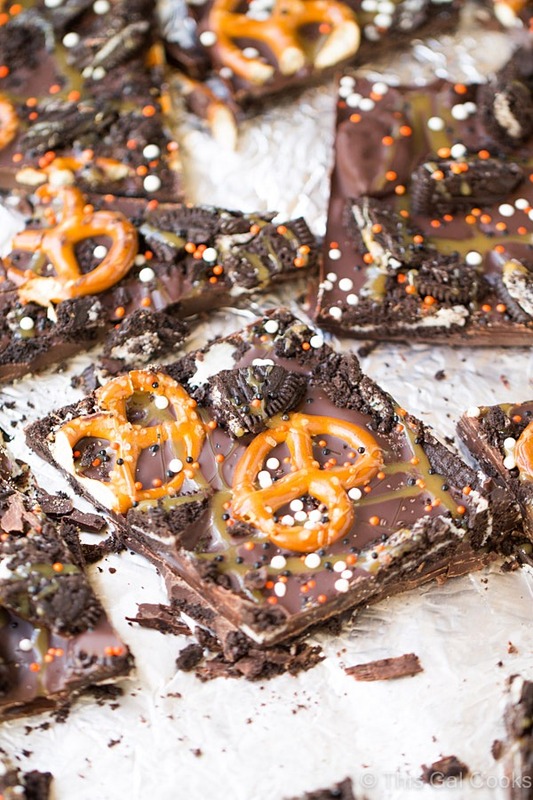 Then I decided to embrace my dark chocolate loving side and make this Dark Chocolate Oreo Pretzel Bark. Since Halloween is less than 2 weeks away, I topped this bark with Halloween themed sprinkles. But you can make this bark for any holiday or occasion. Change the color of the sprinkles used to coordinate with the holiday or event you’re celebrating. 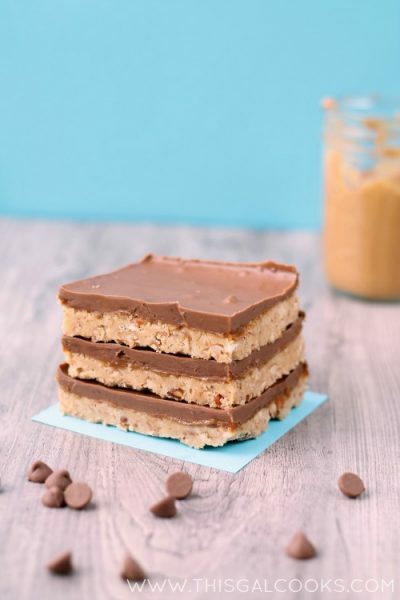 If you’re a fan of sweet and salty treats, then this bark is totally for you. The crunchy, salty pretzels paired with Oreo cookies, bittersweet chocolate and salted caramel sauce is a match made in heaven for the sweet and salty lovers. I’m a fan of sweet and salty treats. I’ve been stuffing my face with this bark since I made it. But as much as I like this bark, I wasn’t totally selfish with it. I shared some of it with my co-workers. And I even let Ken have a piece. I don’t know what’s gotten into me lately but I’m turning into a full blown chocoholic. I may or may not dream about it and I’ve certainly dug into the candy bags that I bought for the trick-or-treaters. I even keep a stash of chocolate in my desk at work. I just restocked my pantry with more baking chips. 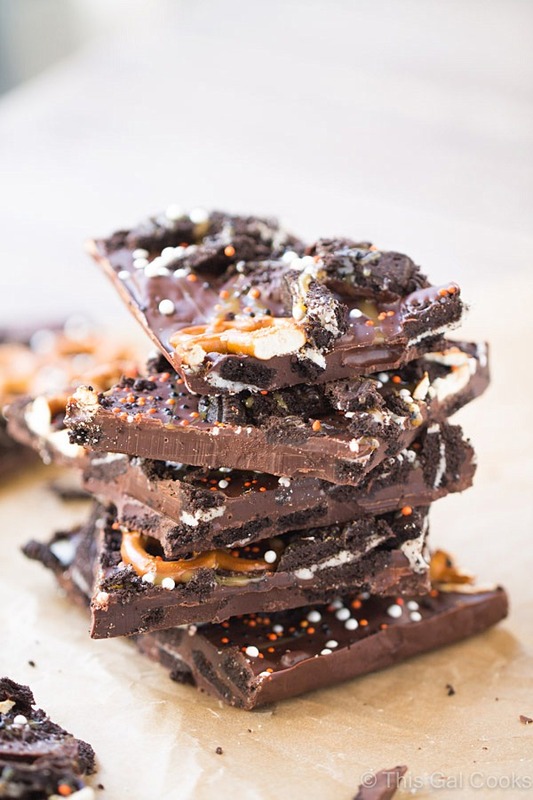 You can bet that I’ll be making more chocolate candy bark soon. Until then, I hope you enjoy this candy bark recipe. Line a 13x9 pan with foil. Lightly spray with cooking spray. Remove excess cooking spray with a paper towel. Melt the baking chips. Start by microwaving for 1 minute. Stir. Then microwave for 1 minute more. Stir. Continue to microwave in 20 second increments, stirring between each increment, until the baking chips are completely melted. Once melted, stir in half of the chopped Oreo cookies. Pour the mixture into the pan. Smooth with the back side of a spoon. Top with the mini pretzels, gently pressing each pretzel into the chocolate. Drizzle with the salted caramel sauce and then sprinkle with the sprinkles. Refrigerate until firm, 30 minutes to 1 hour. Once firm, break into pieces. Try these recipes from other food bloggers. Magic Bar Bark from Crazy for Crust. Cowboy Bark from Averie Cooks. White Chocolate Strawberry Truffle Bark from Call Me PMc. Try these other recipes from me. Festive and tasty, a winning combo Julie! Looks yummy! Bark is the perfect treat and I love the sweet and salty combination of flavors! I wouldn’t be able to stop snacking on this! Sweet and salty is one of the best things ever, isn’t it? Thanks for stopping by, Ashley! I am SO into sweet + salty! Pretzels and chocolate, ftw. Julie, you are so good at making pretty bark!! This looks incredible! I need to make some bark too, because it also looks so quick and easy to make! Thanks for sharing this! Aww thank you, Sarah! I just love the sweet/salty combination. But true story – I hate that kettle popcorn stuff. It’s the only sweet/salty combo I hate. 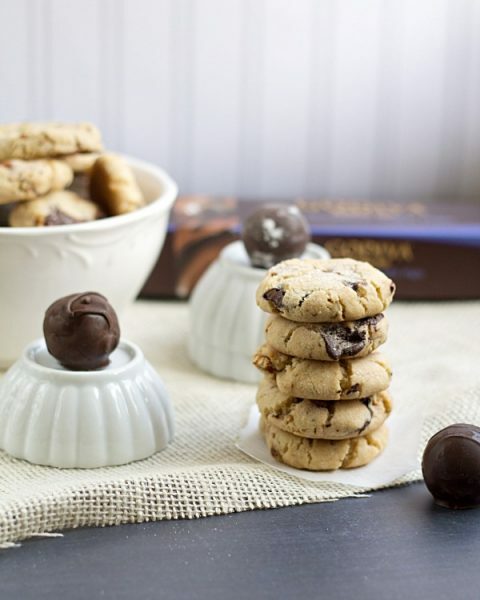 BUT, if you drizzled some dark chocolate over it, I’d probably be hooked! Thanks so much for stopping by and for sharing too, Sarah! 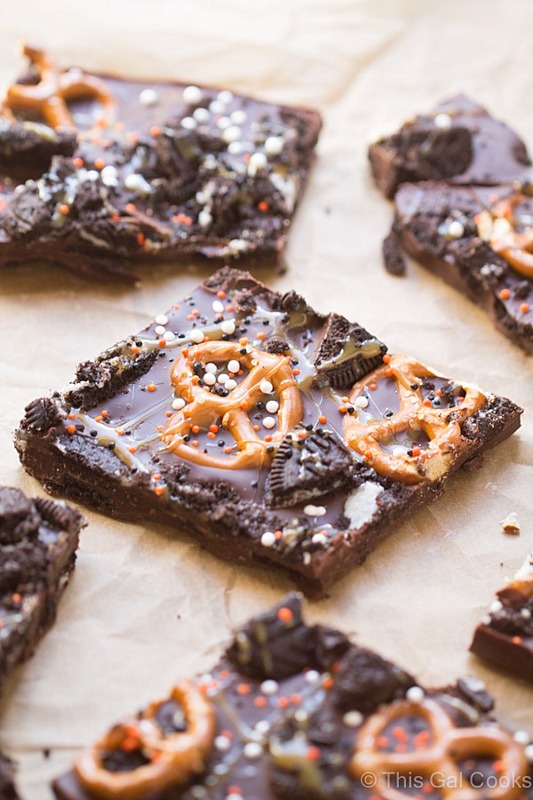 Bark is the best stuff ever, especially with pretzels and Oreos! It sure is! I’ve been drooling over your bark recipes, Dorothy! I want ALL of the bark! Sweet and salty!! That’s where it’s at!!! YES! You are right on the money with that, Zainab! Love this! Sweet and salty is my jam! Sweet and salty is the best, isn’t it? Thanks for stopping by, Karly! This looks just silly good. I am all about the barks and this is one of my faves. Pinned! This looks amazing! I love the combo of sweet and salty. I drool every time I think about this bark! Thanks for stopping by, Allie! I could eat ANY Halloween dessert. It’d be this. Dying. I think I’d pick this, too! Thanks for stopping by, Nicole! I would be totally selfish with this bark too! Love the festive halloween toppers! Seriously, where does everyone find these adorable Halloween sprinkles and stuff? It’s like I don’t live in the largest city in the SE! Pinned! Love how much goodies are jam packed in this bark! Sweet and salty is my favorite! I could munch on this all day! I could too, Kelly! Thanks so much for stopping by! My first thought when I saw this bark was “Come to Mama! !” :) It looks fantastic!